All aboard: Bus Simulator 18 and extensive modding kit ready to depart! 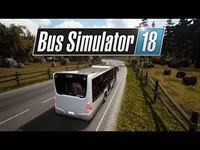 Moenchengladbach/Germany, June 13 2018 – astragon Entertainment GmbH and the developers of stillalive studios are celebrating the release of Bus Simulator 18 today. The gripping bus simulation game for PC is now available in retail and via download in digital stores. Bus drivers who would like to try their luck with creating their own bus models, new maps, cities and other equipment will be happy to see the simultaneous release of the Bus Simulator 18: Modding Kit, which will be available free of charge for owners of the main game at the Steam Workshop! In Bus Simulator 18 players will have the unique opportunity to create their very own bus company either solo in single player mode or together with up to three friends in multiplayer mode and lead it to success in the fictional European city of Seaside Valley. During the course of the game they will be able to access and drive eight officially licensed and lovingly recreated bus models by the worldwide renowned makers Mercedes-Benz, MAN, IVECO BUS and Setra. In the course of the game driving their own buses will not be the only important task for bus enthusiasts, they will also manage their aspiring bus company, create new bus lines, hire new drivers and complete entertaining missions to gain access to more and more city districts and buses. Thanks to the new progression system as well as a wide range of special events and features the game will offer long-term entertainment even for players after they have successfully unlocked all buses and city districts, as this system will enable them to focus on the further advancement of their bus company. Creative bus drivers will also be happy to hear of the release of the Bus Simulator 18: Modding Kit. The Unreal® Engine 4 based modding kit will give them the opportunity to create not only their own buses, decals, adverts and skins but also completely new maps and cities. The finished mods can then be included in the Steam Workshop, where other players will be able to download and add them to their own game. Bus Simulator 18 for PC is now available at a price of 29.99 Euro, 34.99 USD, 26.99 GBP in retail and digital stores. On Steam™ there is a special launch offer for at least the release week including a 10% discount as well as a bonus interior for the Mercedes-Benz Citaro buses. © 2018 astragon Entertainment GmbH and stillalive studios. Published and distributed by astragon Entertainment GmbH. Bus Simulator 18, astragon, astragon Entertainment and its logos are trademarks or registered trademarks of astragon Entertainment GmbH. "Mercedes-Benz" and the "three-pointed star in a ring" are trademarks of Daimler AG and used under license by astragon Entertainment GmbH. Manufactured under license from MAN. MAN is a trademark of MAN Truck & Bus AG. IVECO BUS and URBANWAY are brands of CNH Industrial. Manufactured under license from CNH Industrial. "Setra" and "K im Kreis" are trademarks of EvoBus GmbH and used under license by astragon Entertainment GmbH. Unreal, Unreal Engine, the circle-U logo and the Powered by the Unreal Engine logo are trademarks or registered trademarks of Epic Games, Inc. in the United States and elsewhere. All intellectual property relating to the buses and bus equipment, associated brands and images (including trademarks and/or copyrighted materials) featured in the game are therefore the property of their respective companies. The buses in this game may vary from the actual products in shape, colour and performance. All rights reserved. All other names, trademarks and logos are property of their respective owners. astragon Entertainment (founded in 2000) ranks among the leading independent games publishers in Germany. Our versatile product portfolio focuses on high-quality technical simulation games such as Construction Simulator, Farming Simulator or Bus Simulator, but also covers complex economic simulations and strategy games. The distribution of the Big Fish franchise (Mystery Case Files, Dark Parables, Grim Tales) completes our exciting product range. Games by astragon are available world-wide on many different platforms such as consoles, smartphones, tablets and PC. Please visit us for more information at http://www.astragon.de/en/. stillalive studios is an award-winning game development team whose goal is to create dynamic and unique games. The company was incorporated in early 2013 in Innsbruck (Austria) and today counts about 20 members. We are an experienced and enthusiastic team of game developers embracing both gameplay and technological challenges, working with both Unity and Unreal. For more information visit http://stillalive-studios.com/.